The eDab HELOS is finally here, and we’ve been fortunate enough to get our hands on not only the base unit, but the entire deluxe kit as well! So grab a snack, get settled in, and let’s see what this much anticipated vape pen really is working with! Let’s first touch on the Pen itself. The “piece de resistance” of the kit. The name HELOS is actually derived from the cartridge of the pen which bears the same name. Sounds cool doesn’t it? That’s because it is. Sporting a heavy-duty borosilicate glass dome to hold the vapor from your favorite concentrate, the principle element of the HELOS, is the eNail, which is a ceramic coil with a generously sized “dish” to hold ample material to cut down your reloads. The coil itself is replaceable, which is a crucial factor in keeping costs down and saving you the hassle and expense of replacing the entire cartridge once the atomizer inevitably burns out. The mouthpiece is easily removable, as is the screen that lies just underneath, and with a quick snap, you’re hooked into your battery, and ready to rock. Speaking of batteries, the eDab really shines in this department. The “Spin” variable voltage 650 mAh rechargeable 510 thread battery holds true to its name, as it offers a spinning aspect which allows you to expend minimal effort as you toggle between your voltage output settings. 3.2 will give you a lesser, thinner vapor, while the maximum 4.8 will give you a very thick and hearty amount of mist to enjoy. There are a few “smart” features built-in to the Spin that bear mentioning and the first one is an accidental discharge protection mechanism. Now this is very important for two reasons. One, the last thing you want is your pen activating in your pocket and possibly injuring you or burning your clothing. Secondly, you’re depleting your charge which may leave you high and dry when the time comes for a remote session on your travels. 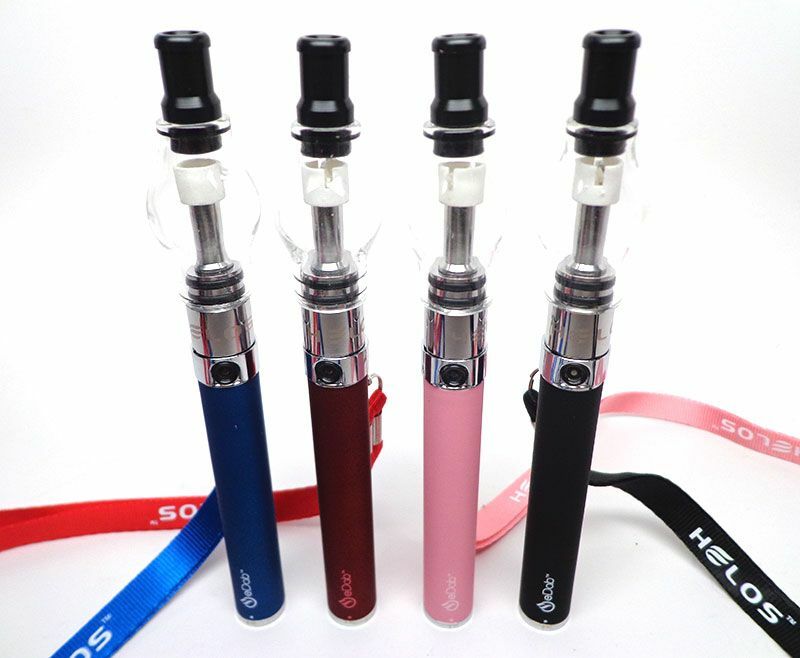 This will defeat the very purpose of having a small, self-contained portable vape to carry with you and use on the go. Not acceptable. And thanks to the minds over at eDab, it doesn’t have to be either. The second feature is called overcharge protection, and it keeps your battery safe from burn out should you leave it charging and say, fall asleep or forget about it. This small slip-up has cost a great many people their pen, and fortunately, you won’t have to give it a second thought. There is also an overheat protection kill switch as well, that activates after ten seconds and stops the heating element temporarily, to keep it in a safe range. Brilliant! Now that we’ve got the HELOS itself out of the way, let’s get down to the extras! The eDab Deluxe Kit comes with a grand total of three chargers, and every base is covered with a standard A/C wall charger, a car charger and a USB plug even. They are nice and compact, which makes for easier travel, and there really is no situation you’re going to find yourself in that one of these three will not have your back for a quick recharge. You’re also going to get two replacement eNails for your cartridge, which is going to automatically save you time and money, a very cool lanyard, and a dope t-shirt with the eDab logo to let everyone know how you roll. With so many bonuses included for the sticker price, and of course the super-premium pen itself, it’s not even a question if this is worth picking up at 90 dollars, You won’t find a better, more inclusive deal anywhere online for a pen of this caliber, so don’t sleep on this one.